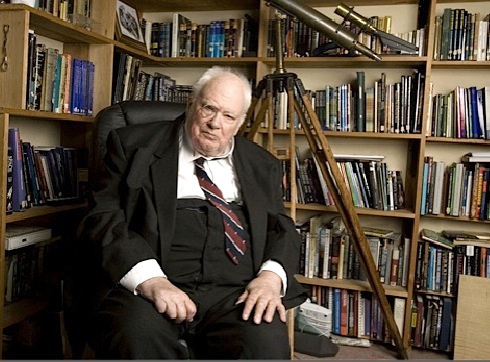 ❚ THE FAMOUSLY FASHION-BACKWARD astronomer and national treasure Sir Patrick Moore CBE, FRS, FRAS, has long been instantly recognisable from his signature XXL blazers, regimental tie, unkempt hair, lopsided eyebrows and monocle. He has died in his 90th year. As Nanny’s childhood lesson in tying a tie-knot grew ever more distant, his shirt-collar size became comfortably two inches larger than his neck size. The rise on a pair of gentleman’s trousers, he evidently believed, should reach to the chest – a mindset which presumably boosted his own rise to unrivalled heights in the realms of international astronomy and cosmology. His own early Moon maps helped the Apollo Mission plan their landings. Since 26 April 1957 Sir Patrick has presented the BBC TV programme The Sky At Night for more than 700 editions, making him the longest-running host of the same television show ever. Moore’s dishevelled appearance and rapid-fire speaking voice are as much part of the nation’s fond attachment to his personality as the programme’s theme tune, Sibelius’s Pelléas et Mélisande. On the show’s 50th anniversary, comedian Jon Culshaw impersonated him as the interviewer while Sir Patrick spoofed himself as a Time Lord. The astrophysicist and Queen guitarist Brian May, who wrote a book on astronomy with Sir Patrick, described him as a “dear friend, and a kind of father figure to me”. ➢ Vintage clips from 45th anniversary of The Sky at Night – Moore plays the music of astronomer Sir William Herschel at the piano. This entry was posted in Media, Technology, TV and tagged astronomy, Patrick Moore, Sky at Night, TV series. Bookmark the permalink.